Victoria: golden strings of time. 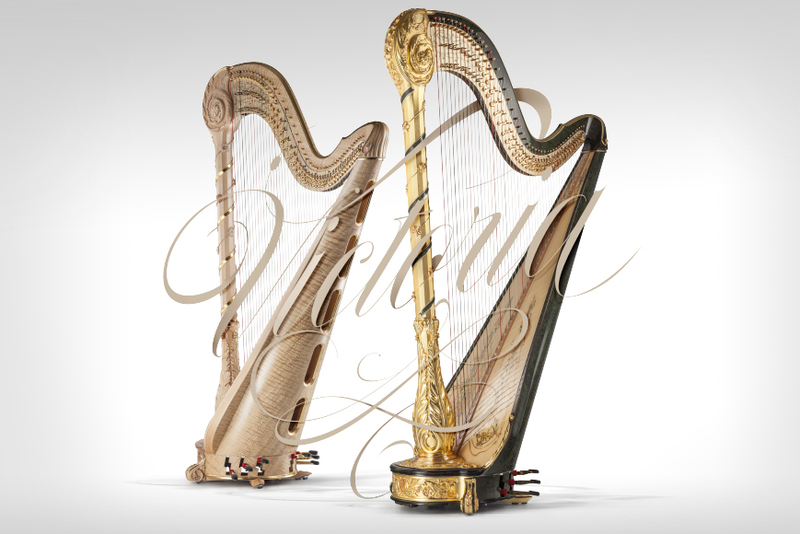 Victoria is an absolutely unique rococo and completely handmade piece, having employed the finest materials ranging from Canadian Hard Maple to the most lavish gold, dedicated to the founder of Salvi Harps, Victor Salvi. Majestic in emerald-green-stained curly maple and covered with red, white and yellow gold leaf in the Gold version, and wrapped in a thin golden ribbon and sculpted flowers, colored with pale watercolor tones, over shimmering Tamo veneer in the Natural version. The precious classical effects of these incredible decorations, inspired by the natural world, produce an instrument that is fresh in appearance and characteristic of the work of Botticelli, making it impossible to miss being in front of an authentic masterpiece. Touching the strings of an instrument like this and holding it close creates a vivid experience that instantly blends every note of the music of those who made a contribution towards the rhythm of its technical and artistic evolution.